Former Aberdeen stalwart John McMaster has backed Derek McInnes' men to overcome Europa League opponents Kairat Almaty. 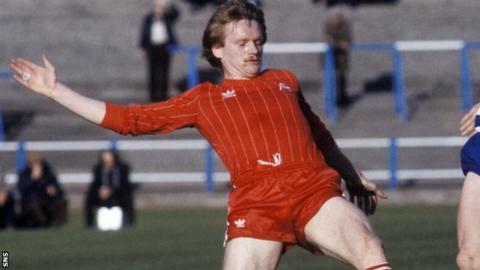 McMaster played over 200 games for the Dons, and was part of the team that won the European Cup Winners' Cup in 1983. "Derek will get a result; he'll know how important it is to the club and Scotland as well," McMaster told BBC Scotland. "I'm going up to the game and I'm looking forward to a win for Aberdeen." Aberdeen trail the Kazakhstan Premier League leaders 2-1 after the first leg in Almaty, but a priceless away goal from Kenny McLean has given the hosts sufficient hope of qualifying on Thursday. "I think Aberdeen's a team that'll score goals both home and away," continued McMaster. "They've had a great result on Sunday against Dundee United. "They need the one goal, but that's dangerous sometimes. Seemingly (Kairat) are not a bad side - I never saw the first leg at all - they got the valuable goal and they never lost any others. "Kenny McLean's beginning to look like the player that he was, because it's just taken him a while to settle in at Aberdeen." Now a scout, 60-year-old McMaster spent 13 years at Pittodrie, and believes his former side will have gained significant knowledge from their recent forays on the continent. "In the last two years, Aberdeen have learned a lot, Derek's learned a lot, so have the scouts, simply because they've gone to the back of beyond," he added. "You accept what you've got, play to your strengths, and try and get them looked at as quick as you can. "There are games all over the world getting taped as we speak, everybody can get contacts or get a hold of information about teams as well. You don't fail on that - as long as you're prepared and you've got a fair idea about how the opposition will play, you're confident about what your own boys can do. "I think that's what's Derek's got now, because he's recruited a couple of experienced boys this year, that'll just gel and make them stronger as well."